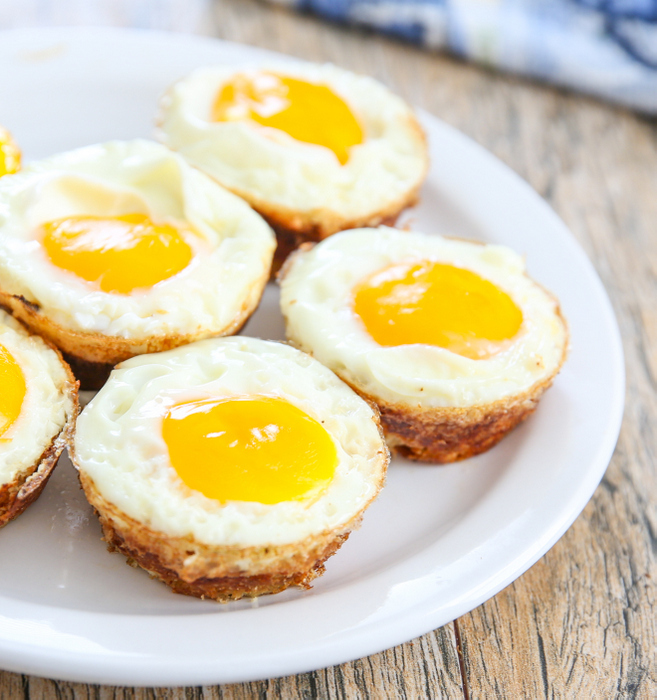 Today’s WINNING recipe to meet Coach JC’s 10 WINNING Habits is Cauliflower Hash Brown Egg Cups. Where are my veggies? Where is my lean protein? 1. Preheat oven to 375 degrees. Spray muffin tin with Pam and set aside. 2. Drop the steamed cauliflower into the bowl of a food processor and pulse until they start top resemble a fine grain. 3. Pour the ground cauliflower onto paper towels and twist to wring out excess liquid. Do this up to three times until the cauliflower comes out completely dry. 4. Transfer dry cauliflower to a large mixing bowl. Add cheddar cheese, garlic powder, salt and two eggs and stir to combine. 5. Distribute the mixture evenly throughout the muffin tins and use your fingers to press the mixture into the sides and bottom of each cup to form the nests. 6. Bake the nests for 15 – 17 minutes or until brown. 7. Add couple of bits of bacon to the bottom of each cup (Optional) and crack and egg onto without breaking the yolk. 8. Bake 7 – 8 minutes. 9. Sprinkle with chives and pepper to taste.